Palestinian Authority leader Mahmoud Abbas has once again referred to the entire State of Israel as "occupied" territory, highlighting the wide gulf between his rhetoric in Arabic and his image as a moderate within much of the international media. 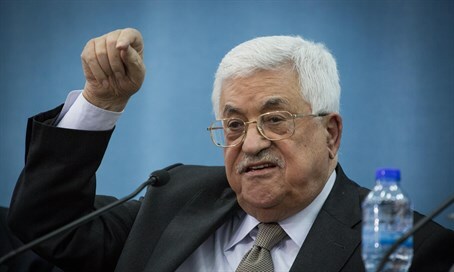 In an interview with official PA TV in mid-March, translated by Palestinian Media Watch, Abbas echoed similar comments he made late last year by claiming Palestinian Arabs have been "occupied" since 1948 - the date of the State of Israel's founding. Such rhetoric lies in stark contrast to perceptions in the West that Abbas's PA only desires a state in Judea, Samaria and Gaza - territories liberated from Arab rule in 1967. "We have been under occupation for 67 or 68 years," Abbas said. "Others would have sunk into despair and frustration. However, we are determined to reach our goal because our people stands behind us." The extent of Abbas's doublespeak is apparent when comparing such statements to the more conciliatory tone he takes when addressing foreign audiences. One example highlighted by PMW was carried by Al-Hayat Al-Jadida later in March, when Abbas met a delegation of Jews. "We strive for peace through the establishment of the Palestinian state, which will live in peace and stability alongside Israel," he told them. Abbas similarly told a Druze audience: "We must hurry building peace here, and find the ideal solution, which is simple - the Palestinians and the Israelis will live in two states that will exist side by side in peace and stability, because we want our children and grandchildren to live a good, normal, and prosperous life." Israeli officials often point towards Abbas's doublespeak to illustrate how they say he manipulates Western audiences with messages of peace, while encouraging his own Arab population to continue fighting to destroy Israel. Other PA officials have often been far more direct in their statements, describing any future "two-state solution" as only the first stage in destroying Israel, and describing a "West Bank state" as "just a phase" before wiping Israel out entirely.